RT Minerals Corp.: Welcome to RT Minerals Corp. Welcome to RT Minerals Corp.
Norwalk Property - Gold property located approximately 6 kilometres south of Wawa, Ontario, in which the Company has an option to earn a 100% interest, subject to a 2% net smelter royalty. 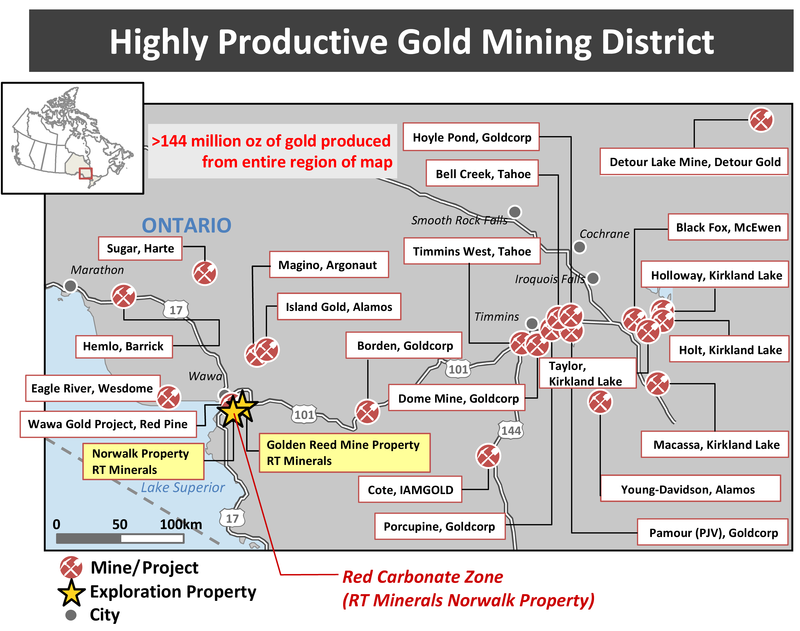 Golden Reed Mine Property - Gold property located 6 kilometres southeast of Wawa, Ontario, in which the Company owns a 100% interest, subject to a 2% net smelter royalty. The property is staked within Red Pine’s Wawa Gold Project. RTM has top international project managers and geological team (former NYSE, LSE, ASX and TSX listed company employees and consultants) well respected in the international diamond and gold exploration and mining industries. RTM has interest in its projects indicated by other exploration and mining groups.